At The WaterLeaf, we know that nothing is more regularly anticipated than meal time. 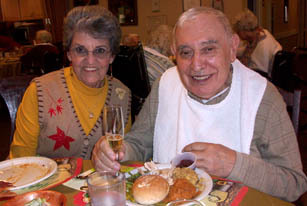 We strive to provide a varied menu of tasty and nutritionally well-balanced meals for our assisted living dining experience. We enjoy planning special food and décor for holidays and special occasions. Between meals, the snack cart is always making its rounds to individual rooms. And for Residents with dietary restrictions, we provide accommodations with alternative options.